Job openings declined by 538,000 to 7.09 million in February, marking the lowest level since March 2018. While most economic pundits call out these nominal levels, you also have to adjust for the size of the labor force since the data dates back to the end of 2000. In that context, job openings as a percentage of the labor force fell to 4.3% from 4.7% in January. Although that’s a notable drop in one month, January 2019’s print was the second highest on record in nearly two decades. Even at 4.3%, openings remain significantly higher than the peaks of the two prior cycles (3.7% in early 2001 and 3.3% in early 2006). It’s also important to note that JOLTS data tends to be choppy similar to the first Friday jobs report. Nonfarm payrolls only rose by an upwardly revised 33,000 in February, but snapped back to +196,000 in March. The same could happen for job openings in the next report for March. Before we sound an alarm, we’ll need to see a declining trend. With that said, here is our concern with the report: the number of job openings has exceeded the number of unemployed workers for 12 straight months. Prior to March 2018, the number of unemployed workers always surpassed job openings dating back to December 2000 when the data series started. Meanwhile, there were 852k more jobs available than people without a job but wanting one in February. That gap represents a huge disparity in workers’ skills and employers’ requirements. Even though all these industries experienced a decline in job openings in February like the overall US labor market, the ones we highlighted include those with the biggest gains since the height of the last economic cycle. 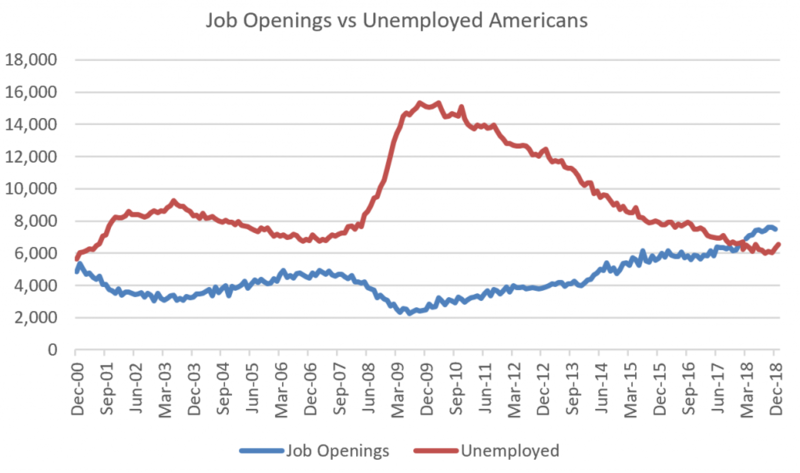 The upshot here is that while job openings in the information sector have fallen, the gains in openings in even just two of the other industries we noted would make up the current difference between openings and unemployed workers. Why this is important: to continue getting strong job prints like in March, employers will need to pull more non-college educated Americans into the workforce to fill these jobs. We’ve outlined in recent reports how participation rates for this cohort lag those with a BA/BS degree. Workers shouldn’t always need a 4-year degree to take care of the elderly, get a job in retail, or work in the restaurant industry as a few examples. Loosening up educational requirements in the industries with the largest increases of job openings in the last +10 years would go a long way of strengthening the US economy. Unsurprisingly given the weak February jobs print, the number of hires dropped by 133k to 5.7 million during that month. That’s its weakest level since September 2018. Hires as a percentage of the labor force fell to 3.5% from 3.6% in January, a level it’s hovered around for several months. On the brighter side, the number of people quitting their jobs only slipped by 3k. 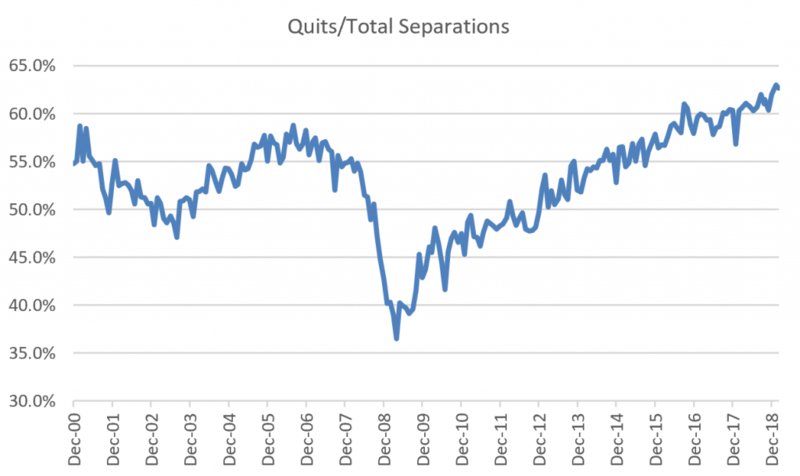 Therefore, quits as a percentage of the workforce was unchanged at 2.1% compared to the prior month. That’s one of the best prints back to 2000; the peak was 2.3% in January 2001. We view this as a positive because it reflects workers’ confidence in near term economic conditions. Our “Take this job and shove it” ratio – or quits to total separations – reached its second highest level of 62.6%, just under the all-time high of 63.0% this past January. We predicted wage growth above 3.0% before it happened based on this measure, so we’re not surprised to see it hold up given workers’ continued strong confidence. Why? Workers usually quit their job after securing a better-paying position. In sum, this wasn’t a particularly good JOLTS report, but the US labor market remains on solid footing. How long this lasts will come down to employers’ willingness to hire those without a 4-year college degree.